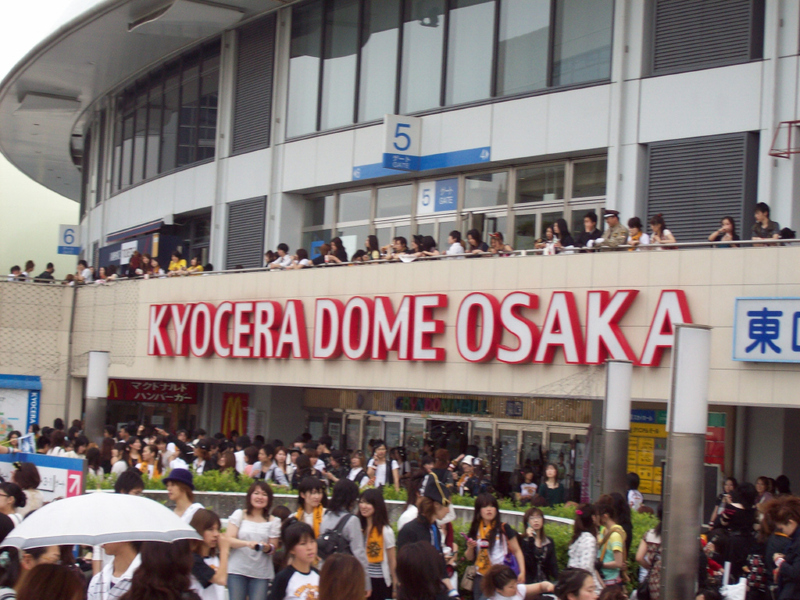 I arrived at Kyocera Dome at 2:30pm and even by then, many goods had already sold out. 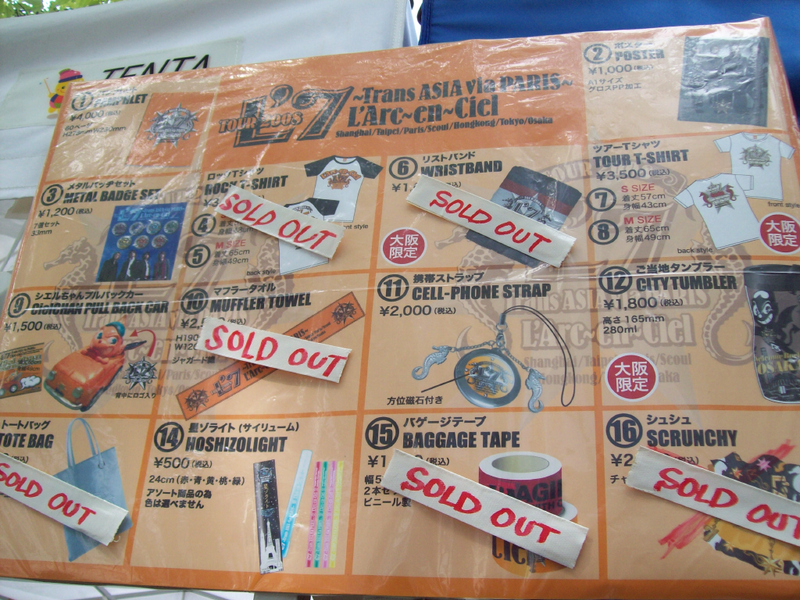 (wristbands, special Laruku packing tapes, towels, tote bags and even ponytail holders) If you spent over 5000 yen (around $50), then you got a free "service bag" which was, essentially, a typical vinyl tour bag with the band's logo on it. 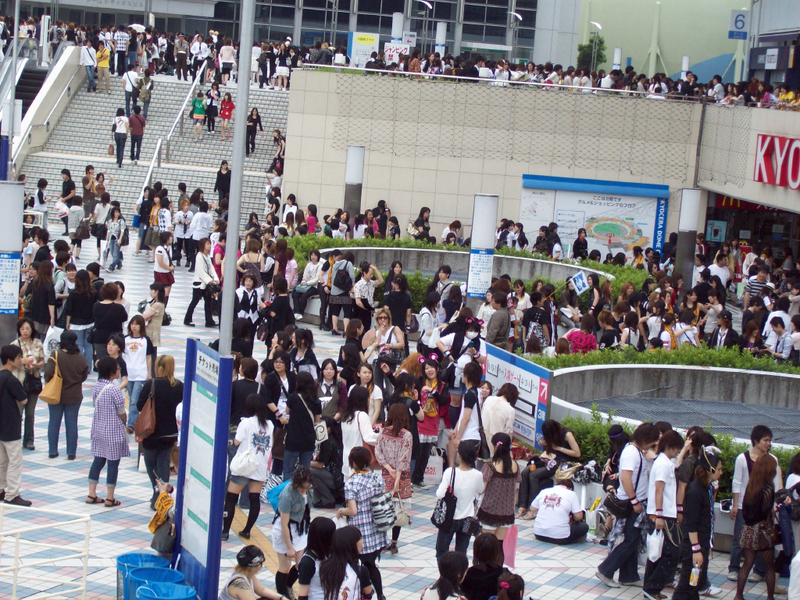 And to my surprise, there were very few gaijin (foreigners) at the show. At the D'espairsRay show, roughly 30% of the audience was made up of people from all around the world but at the Laruku show, there were probably only 15 gaijin including myself. Around 3:00pm we met up with three of our customers!! We met Deborah and her husband from Hawaii and Nuth from America. 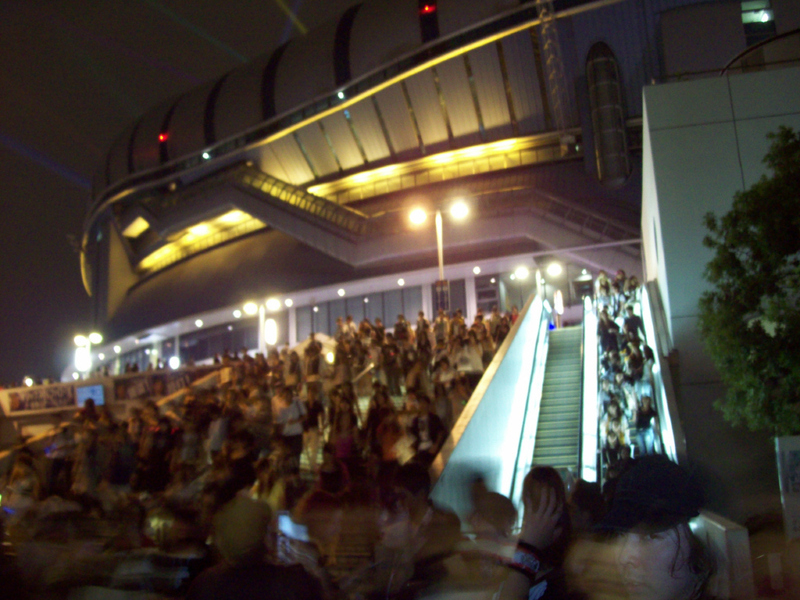 After we chatted for a bit and took some pictures, we decided to make our way towards our respective seating gates. It took some time navigating through the seemingly endless sea of people and there were probably 20,000 attendees just wandering around the Dome or looking for their friends. Cosplayers of all types were in attendance. Though there were very few Laruku cosplayers, there were many lolitas of all genre and even some cosplayers of some other JRock bands. I headed towards my gate (the fifth one) and had to walk up several flights of stairs. I was up at the top in the stadium seats to the right of the stage (but the band's left). All-in-all, I would guess that there were around 40,000 people in attendance!! There were two curtains over the stage and images of Laruku were being projected onto it. On either side of the stage, there were 12 banners and various American songs were being played over the sound system. After waiting for what seemed like forever, the lights went down and everyone lit up their hoshizo lights, creating a beautiful sea of colour. Next up was "Pretty Girl" and the stage was lit up a bit more. I could see that hyde had many little braids/dreadlocks in his hair and looked as beautiful as ever. He had on a white, long sleeved shirt and a black vest with matching black pants. He kept doing this kawaii little dance during the song thus, causing the audience to go wild!! And now that I had better lighting, I could see that the entire stage was designed to look like a ship!! That explained the odd positioning of all the flags and banners. There were also cannons all over the stage and the band members took runs running wildly from one mast of the ship to the other. It wasn't too long before the lights dimmed again and "Caress of Venus" started. This shocked the heck out of me because it's one of their oldest songs and I was thrilled to be hearing it live. There was a beautiful disco ball on stage spinning rapidly and projecting blue "stars" onto the dome. hyde blew kisses to all of us and said "Thank you." at the end of the song. "Drink It Down" was the next song followed by "Shine." Then, the band sat down on stage, very close together, and started on "Sell My Soul." I could see what the rest of the band was wearing at this point and it was a matching shirt/skirt/pants set for Tetsu, Ken in one of us usual suits and Yukihiro in a nice white ensemble. hyde had put on a hat at this point and both he and Ken looked very sad during this song. The sadness was forgotten when "get out from the shell" started and the energy intensified. There were acrobats on ropes on either side of the stages as well as break dancers. The strangest part by far, however, was the "ghost" pirates. Some of Laruku's crew members were dressed up as pirates with tattered clothing and they were on stilts, thus allowing the tattered clothing to flow and adding to the ghostly image. A heavy guitar riff started off "The Nepenthes" and then "My Dear" began and we got to see Ken play piano. hyde's eyes were very expressive during this song and he looked as though he was about to cry. The lights went down for a moment then fires started burning on the stage. Laruku reappeared and hyde started playing a saxophone, signaling the beginning of "Lorelay." And then, "forbidden lover" began and I was, again, shocked!! This was one of my favourite songs lyrics-wise and for the fact that there's SO much emotion in the composition and in the way hyde sings it. hyde's beautiful voice was filled with longing and sadness and it gave me chills!! It was such a wonderful performance and I was almost in tears. All seriousness disappeared when "Daybreak's Bell" began. The band actually messed up and hyde looked at his bandmates like "Wtf?!" before telling us "Gomen, mou ichido." This was shortly followed by Ken's MC. He asked us if we were "OK" then told us that there would be any lives for a long time. :( Ken went on to chat about how he could finally play "My Dear" on piano with no problems and then he played a game with us. 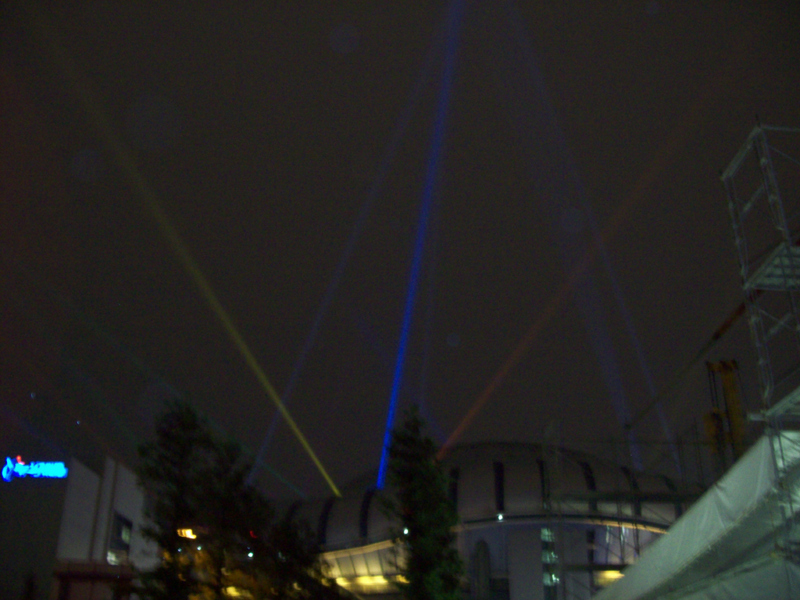 He would say a colour and everyone that had that colour of hoshizo light had to hold it up. We kept messing up and he kept yelling at us and it was quite comical. ^^ He then announced that "Seventh Heaven" was next. "Killing Me" and "stay away" followed and then the last song of the main set was "Ready Steady Go." Many fans were headbanging along with Tetsu and it was wild!! The band really gave it their all and then the next thing we knew, the first part was over. Tetsu was jumping and running around the boat (even though it was very small) and Yukihiro was smiling at everyone, getting them worked up. The boat finally stopped at the back of the arena floor and we were treated to a P'unk~en~Ciel encore!! First up was "milky way" and Tetsu was shooting everyone with a water gun before tossing it into the crowd. And next up was "Feeling Fine 2007" and at this point, Tetsu jumped off of the boat and was running around on the arena floor, much to their management's dismay. After this short encore, they all got back onto the boat and it floated around the other half of the arena floor. More goods were thrown out before the band disappeared behind the other side of the stage. It was a short wait before Laruku was back on stage again. The first was a new song, "Nexus 4," and it was high energy and very entertaining. And then, they treated us to yet again another older song and this time it was "Drivers High." Flames were ignited on stage and everyone jumped up and shouted "Crash!!" along with hyde during the chorus. Next up was "Link" and shiny streamers shot out over everyone. Voice behind stage: "First up, drummer Yukihiro, player number 303. I heard you came to Osaka by car and it's a long trip!! I want to ask you something Yukihiro-san. Since you love your car so much, if you were to go on a date, where would you take your girlfriend?" Yukihiro: "First, we would fly to LA and then we would drive coast to coast to New York." Tetsu said it in French and was then prompted to say it in Chinese, Korean and finally Japanese. It got quite comical and Tetsu stood there with a puzzled look on his face the whole time!! Ken, player number 5, talked about eating a rather interesting dish (something that was consisted of a whole fish, head and all) in Hong Kong and then showed us his expression during eating it. hyde, player number 666, was last and he was asked why the tour final was in Osaka. hyde: *Looks at his bandmates* "...Because it's our hometown I guess?" and went on to tell us that after the show, they were going out to drink and celebrate. The next to last song was "My Heart Draws a Dream" and the audience and hyde took turns singing the chorus to each other; it was very sweet!! ^^ hyde took the time for one last MC and he was talking about all the places they went. 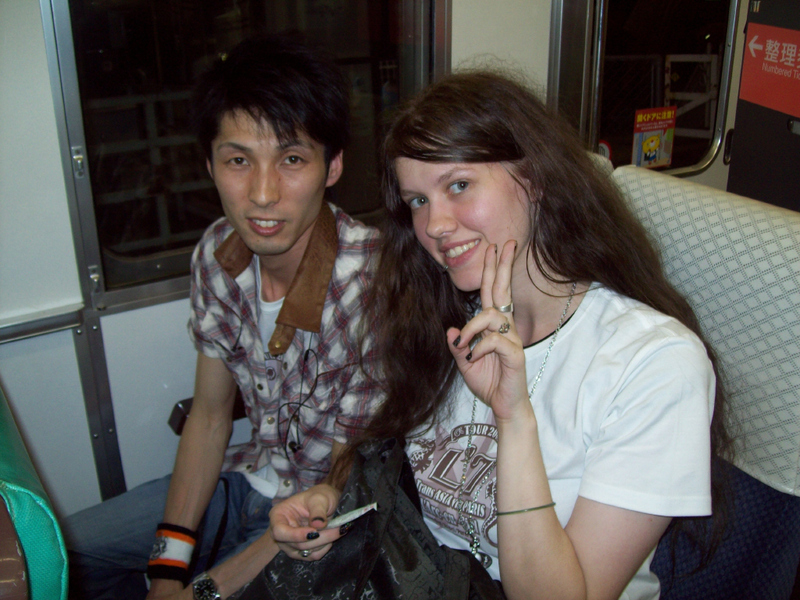 He was really tired and couldn't remember all the places they went outside of Paris, Tokyo and Osaka. He struggled while trying to think of Taipei but he finally just said "Taiwan and err, Hong Kong" and it was so cute!! 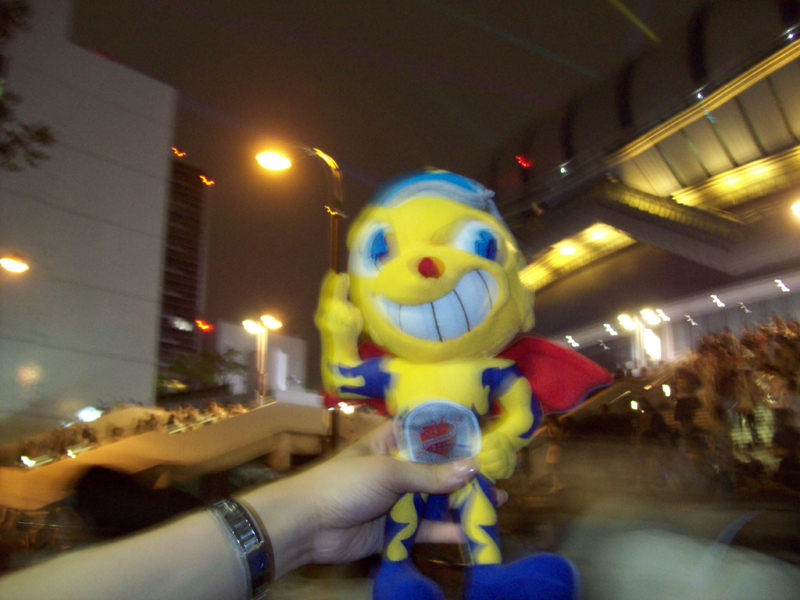 hyde: "L'Arc~en~Ciel formed in Osaka and it has never left Osaka. We have never been to somewhere where people weren't waiting for us. For a while, there won't be any lives. We have been to SO many countries and met so many people. Will you wait for us? We will be back on an even stronger ship so please look forward to it!! This is the last song. Tonight, we will see a beautiful starry sky together."